If you have lived in Seattle for longer than a few hours, you have probably already experienced its infamous climate — cold, dreary, and wet. Indeed, the average temperature in June is between 52 and 60 degrees. Not to mention January, where the average temperature hovers between 36 and 40 degrees with only 74 hours of sunshine. We don’t need to harp on the climate, as you have probably grown accustomed to it and love it nonetheless, but we mention it because the Seattle cold actually has palpable effects on your dental health. This connection might seem superfluous, but the cold affects your dental health just as it affects other realms of your life — what type of oil you put in your car, the cold-weather climate wardrobe you buy, the places you choose to vacation, and practically every aspect of your Seattle life. It is time to start being proactive about the effect of cold weather on your dental routine. Even though our teeth might seem dense, they are actually porous. This means that they are naturally sensitive and that their membranes can be penetrated by things like…cold air! You know that awful feeling when you sip on something too hot or chew directly on a popsicle? If you have sensitive teeth, these actions send zingers through your teeth and cause pain and irritation. Whether you have sensitive enough teeth to feel this sensation or not, your teeth are used to the homeostasis of your body temperature — when you introduce hot and cold to your mouth, you disrupt your dental health. Teeth act like any other material when they are exposed to cold and hot. When they are exposed to cold beverages or chilly Seattle air, they contract. As you close your mouth or enter a warmer room, your teeth expand. Over time, this pattern of contraction and expansion can actually cause hairline cracks in your teeth. Hairline cracks aren’t usually visible, but they essentially expose your teeth to more sensitivity and pain. While you can’t magically change the Seattle climate and your need to respirate, you can try to breathe through your nose only. A better bet is to see a Dentist in Seattle for annual checkups to make sure your teeth are as strong and healthy as possible. Preventative care is the name of the game, here, as is a strong dental hygiene routine of brushing, flossing, and using a fluoride rinse to promote tooth strength. For a general dentist in Seattle, contact First Hill Dental Center. Do you suffer from inexplicable jaw pain? Have your teeth worn down over the years even though you don’t grind them? Blame the cold. Really, cold weather naturally causes us to hunch over and clench in an attempt to stay warm. When your jaw clenches and your teeth chatter, you usually build more jaw problems than heat. This primal instinct can lead to enamel decay, jaw pain, and tooth erosion. If you visit a Seattle Dentist, they can x-ray your jaw, check your levels of tooth decay, and recommend a treatment accordingly. It might be that you get a custom-fit night guard to prevent further decay. Your dentist might also recommend fillings or crowns depending on the severity of the decay. The cold can actually be one of the most helpful signals that you have dental problems to be addressed. When cold air sends zings through your mouth, especially if they do not subside, it might be telling you that you have exposed roots, outdated fillings, eroded crowns, gum recession, infection, and an array of other dental issues. If you find that your teeth are extremely sensitive to the cold, to the point of pain, schedule an appointment with a Dentist in Seattle as soon as you can. The Seattle cold won’t go away, but at least a dental visit can evaluate and treat any dental issues you might be having. First Hill Dental Center is a local Seattle Dentist committed to your health care and livelihood. 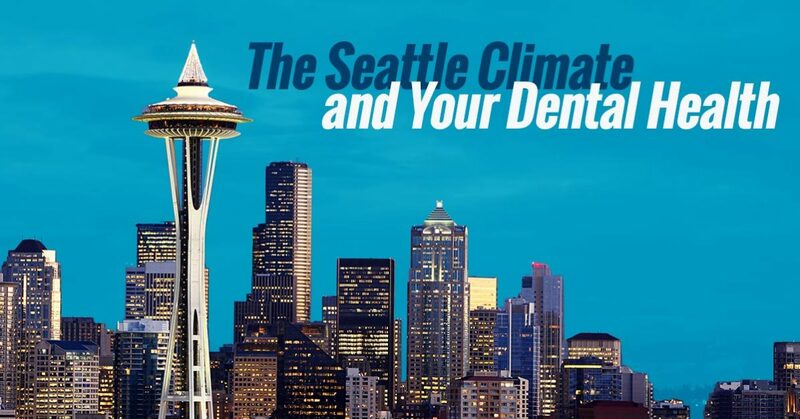 As a local dental office in Seattle, we know the effect that our climate can have on your oral health. Contact our Seattle dental clinic today to make an appointment with our team.